I used to have a negative perception of Capital One - Why? I don’t really know; it might have something to do with the fact that the landlord I hated used this bank, and I had no other encounter or experience with Capital One other than this. They are not omnipresent like Bank of America, and I didn’t know this brand’s personality, reputation, offerings, features, whatsoever. In fact, most banks and financial services probably do not make people feel like they have personalities. But things have gradually and subtly shifted my perception, largely because of their “Capital One Café”. 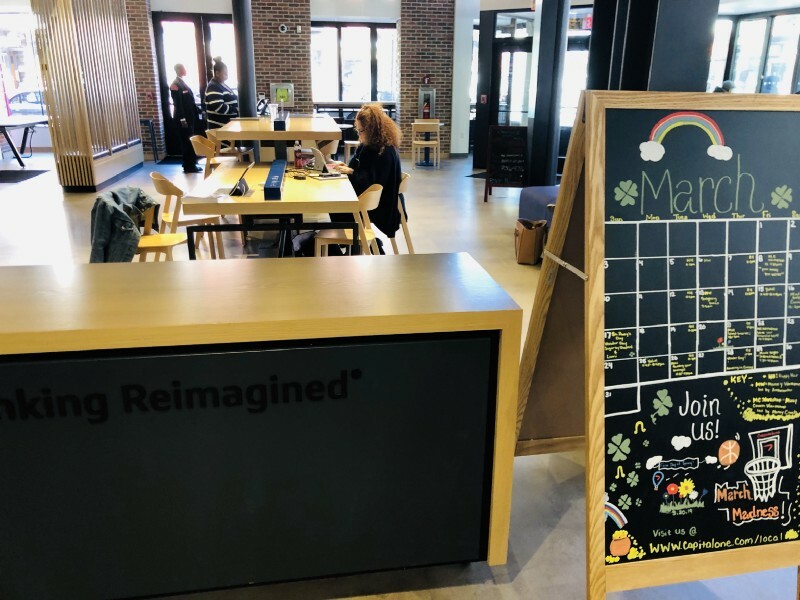 Some people call it a Peet’s Café with bank services, some consider it a “WeWork” space, and some think it’s like a community center. In fact, I think it’s all of the above. High traffic Capital One Cafe at Chinatown, Washington D.C.
My first interaction with the Capital One Café was in Philadelphia. One of my friends, who was a Capital One cardholder, told me about this “cool and hip” place and took me there. She also bought me coffee and drinks at half price using her Capital One card. I was impressed with this concept, enjoyed chatting with my friends, and didn’t think too much about switching banks or opening a credit card, etc. Then I traveled to Boston, a different friend took me to another Capital one Café. I was excited when the Capital One Café opened in Chinatown D.C. this past fall - It’s larger than the ones I visited in Philly and Boston, beautifully and modernly designed with a tall ceiling; staffed with friendly “Café Ambassadors”, and spaced with big interactive screens, tables, work stations, private nooks, conference rooms, and of course ATMs. There are also free “Money Coaching” sessions, financial planning events, and entertaining community events, like “movie night”, “board game night”, “march madness”, etc. 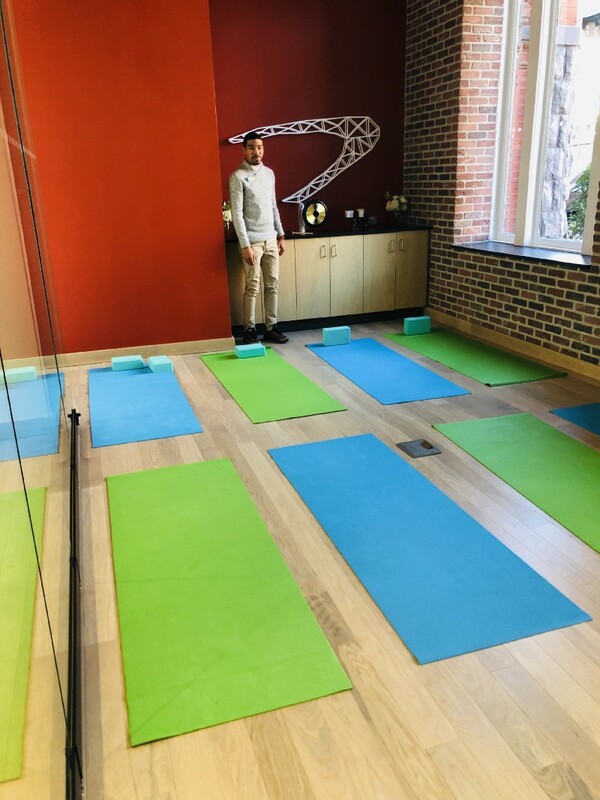 Yesterday, I attended one of their monthly free Yoga sessions. And today I got free cupcakes samples and veggie juice samples from two local vendors who set up stands within the Café. Through the past few months of interaction with this Café and its staff, I started to feel close to Capital One, as if it’s a local friend of mine - a friend who understands my needs, offering help that fits into my lifestyle, and is able to give me guidance on a subject matter when I need it. This feeling surprised me, since I never had a similar feeling like this towards any bank. In fact, I thought banks would always have to be the annoying entity you have to deal with when you have no choice. Considering both the emotional and functional aspects, I decided to open a Capital One credit card account. So, yes, they have successfully converted me, probably with more emotional appeal than rational appeal. And similar to my friends in Philly and Boston, I started to spread the word about Capital One Cafés voluntarily, since it’s also my “social currency”. As a Marketing professional myself, I know too well all the goals and means of a lot of brands’ tactics and activities; so I tend to be immune to many of them. Despite knowing their intentions, Capital One’s branding and inbound marketing effort has been successful on me: the Cafés made a warm and non-intrusive physical appearance in my life, focusing on “my needs” as opposed to their business needs of converting me, attracted me to constantly come to them, built the trust between me and the brand, attracted me to learn more about their business, gently switched my brand perception, and turned me into a customer, then a loyal customer, and now a brand advocate as I’m voluntarily writing this blog. Throughout the entire journey of my customer experience, from Awareness to Interest to Decision, from Engagement to Loyalty to Advocate, they have done a great job in each stage: respecting the distance, keeping patience, and focusing on building the trust and the brand-to-consumer relationship. They do not yell “open an account” to you all the time, or preach about how great their products are. The method and philosophy they are adopting for the branding and marketing effort from the Café are truly “Inbound”, and it echoes the shift from a business-centric mindset (the brand is Luke Skywalker) to an audience-centric one (audience is Luke Skywalker and the brand is Yoda). An article from Insight Vault criticized the “bank cafe” concept as a stupid and ineffective idea - claiming it is inefficiently competing with Starbucks and Dunkin Donuts, criticizing the high cost and low ROI, and sniffing about the concept of “branding”. 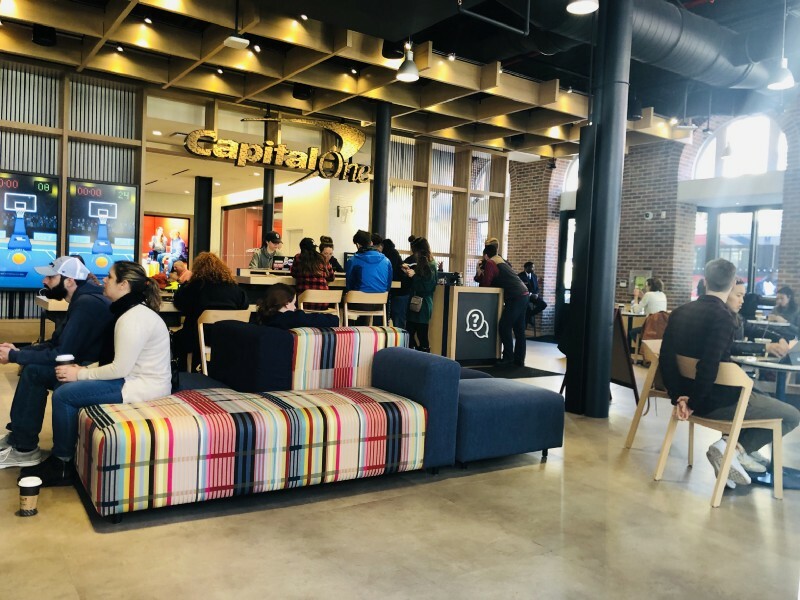 I’m not sure why the author’s takeaway of this concept is that Capital One wants to compete with coffee shops - in fact, they are probably subsidizing Peet’s coffee to be able to achieve this branding and inbound marketing goals. They are not competing with the coffee business, in my opinion, nor is the business goal of the Café to convert customers. The Café is just one of many touch points the bank has with a customer. As a touch point early in the audience journey, the Café’s goal is to attract traffic and visits, to offer help and build an emotional connection, and ultimately to build trust, especially among younger generations. Trust, as many articles point out, is vital to millennial and Gen Z consumers more than ever before. It’s fatal to always link the branding and inbound marketing spending to sales revenue. One burns money to achieve the goal, while the other count money to achieve the goal. It’s also important to be patient and consider a customer's Life Time Value (LTV) rather than focusing on acquisition/transaction numbers at all stages. Customers gained through emotional connection and trust are more likely to stay as loyal customers, spend more on the brand, and become brand advocates.Emotionally engaged customers have higher LTVs compared with those acquired through one-off promotions or advertisement. Having reverse engineered Capital One Café’s branding and marketing strategy, I believe they know exactly what they are doing and they seem to be on the right track. Consumers are imperfect social beings who constantly make decisions based on a combination of emotion and logic. In fact, the role of emotion plays in our decision making and our perception of a brand is much bigger than we would like to acknowledge. That’s why it is vital for a brand to establish an emotional connection with its leads and customers. As much as I can’t rationally explain why I didn’t like Capital One in the past, I cannot fully articulate why I really like it now. Just like many Apple fans will feel personally attacked when the brand is attacked, perceptions of a brand are irrational but essential. I give Capital One credit for bravely innovating the banking concept and making an effort to establish an emotional connection with its customers. Emotional loyalty matters. Cheers to brands who have shown real signs of switching from Business-centric to Audience-centric. Vivian's article originally appeared on Medium.